Just purchased Affinity Windows version today. Why would the shape or position of the histogram be different when viewed in the Develop Persona compared to the Photo Persona. Attached are two screen dumps, 1) A RAW file just prior to developing, 2) The same image immediately after being developed. I find it difficult to adjust a RAW image due to the positioning of the graph in the Develop Persona. My camera is an Olympic EPM1, the image is an ORF. I get the same the histogram graph is different in Develop Persona compared to the Photo Persona. My camera is an Nikon D90 and the image is an NEF file. On further investigation with other RAW ORF images it is clear that the shape or position of the graph on the histogram is not correct. With all of the images I checked, the histogram was bunched up on the left hand side indicating that the blacks should be clipped. However, if the "Show Clipped Shadows" is activated, the shadows are not clipped, there are no "blue" pixels appearing on the image. 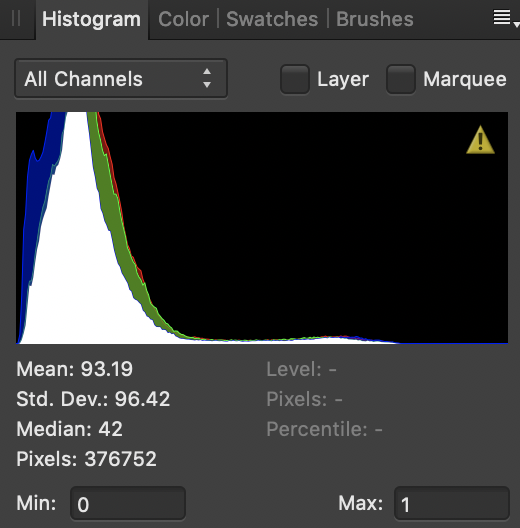 The histogram barely moves out of the blacks clipped region of the graph even if I move the Blackpoint slider to the extreme left. It seems that the graph is not correctly calibrated. This issue was apparent to me from the first windows beta version I downloaded. It makes the RAW module virtually unusable for me. Hey all, this is likely because of the unbounded colour format and linear colour space that is used for RAW processing - when you click Develop, the colour space is converted, and unless you set the output to 32-bit, the colour format is also converted to 16-bit integer. Whilst this offers increased precision and quality for RAW processing, the histogram range will appear much wider compared to the developed image. This explains the differences in the histogram but doesn't offer a resolution - will let you know if there are any potential solutions to this. Thanks James for shedding light on my issue. I am not concerned about the number of bits output. The way I have Affinity setup is purely accidental. I cannot find a setting to make a change to the output that changes the scale on the histogram. The place I looked was Edit/Preferences/Colour but I don’t know what to select. How can I change my setup to achieve the mobile, centred histogram graph depicted in the tutorials? I guess the answer is to be found in the tutorials. I have viewed quite a few tutorials so far. Until the help system is written, one cannot search for answers effectively. I am not sure I understand what you want to do but to get a free-floating ("mobile") Histogram panel you drag its tab out of the Studio & drop it somewhere else on the screen. This works for any Studio panel. Many panels, including the Histogram, can also be resized by dragging an edge. So while you can't actually change the scale, you could drag the Histogram panel out of the Studio & make it much wider than is possible when 'docked' in the Studio. I know I can resize and re position the panels. This is not the issue. Resizing does not alter where the points are plotted on the graph. If you look at the attachments to the original post, see how the graph is bunched up (crowding) the left hand side for the Develop persona. All of my RAW images show the Blacks as being clipped on the histogram (even though they are not) where-as once the image is developed the histogram becomes centred as in a "normal bell curve". With regards to "mobile" what I mean is that in the Develop persona, moving the Blackpoint slider from end-to-end barely shifts the clipped blacks on the histogram. The graph remains heavily weighted to the left. I cannot adjust any image in the Develop persona to produce a normal bell curve. I have exactly the same problem on my win 10 laptop. This makes Develop Persona unusable for me. Is this still not addressed/fixed? I'm unclear if this is a bug I'm experiencing or if I just have something configured incorrectly. 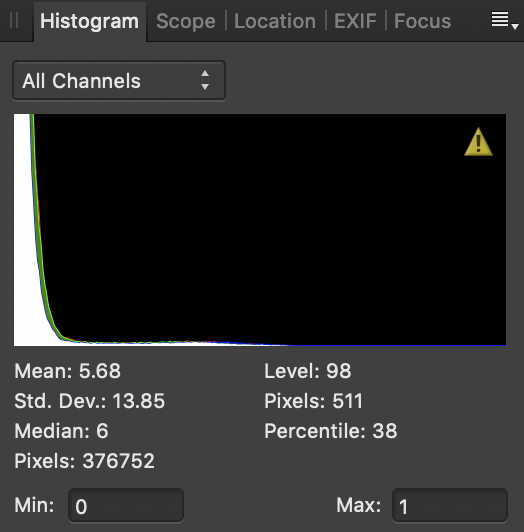 Here is an example of what I see in the histogram when I open a raw file (develop persona) and after clicking the develop button (photo persona). This is Affinity Photo 1.6.7 on macOS 10.14.